Yellow Mountain (Huangshan) Maofeng Green Tea comes from the Yellow Mountains in China, one of the most beautiful natural settings in the world. The Yellow Mountains are famous for their rolling fog, steep rock faces, hot springs and small mountain pines. 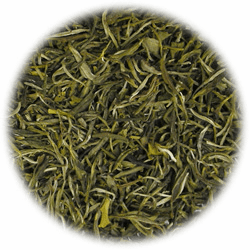 Yellow Mountain Maofeng is a green tea grown in the foothills of the Yellow Mountain range where it is almost always foggy and humid. It is considered one of China's most famous teas. The leaves are picked only in the spring when they are very young and only contain a bud and a single unfolding leaf. Only unbroken buds and leaves are processed for this tea.